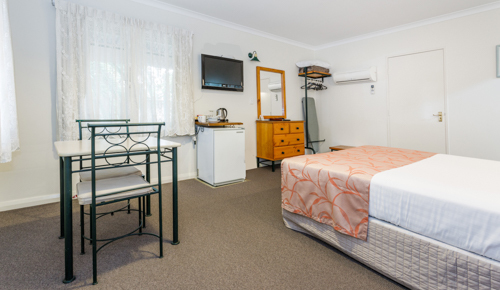 This room accommodates up to 2 people complete with a Queen bed and ensuite bathroom, seating area, small bar fridge and tea & coffee making facilities. There is no kitchenette or courtyard with this room type. Please see our Deluxe Rooms with Kitchenette if you would prefer these amenities. This room can also be inter-connected with our Deluxe Room with Kitchenette.